Poppet's Window: Oh My Omah's! There are the little surprises at Omah’s and then there are the big surprises. One of the big surprises is their Salted Egg Crab, one of five whole mud crab dishes. 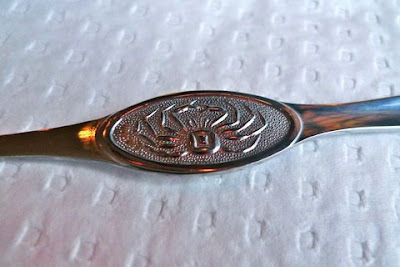 If you order a mud crab, you will be provided with a disposable bib and appliances that resemble ancient torture tools. Egg yolks are mixed with condiments and seasoning before the mammoth crustacean is wok-fried Straits Peranakan style. 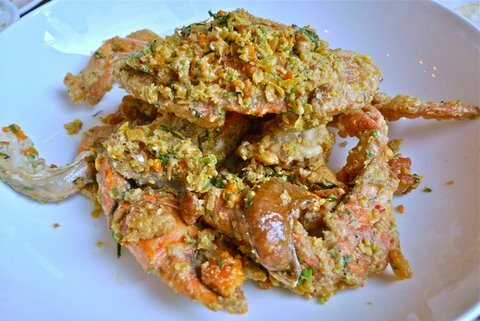 The result: a crispy sweet and salty shell, perfectly cooked white crab flesh and some seriously sticky fingers. You have to work for your dinner: cutting, cracking, digging and slurping, but it’s worth it. There are also the little surprises, such as the crab loyalty card where the sixth crab dish is free. Then there is the attentive table service, including the waitress who brings two bottles of water to the table: one to fill the glasses before she leaves, and one to remain on the table for when they are empty. Now that the big and little surprises have been covered, there is everything in between. The word omah translates to ‘grandmother’ in Malay, but there is nothing old-fashioned about the layout of this local Hawthorn restaurant. 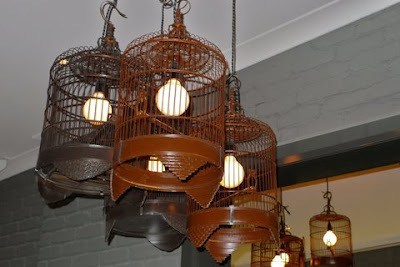 Birdcage lights, oriental lattices and dark wooden furnishings add a traditional touch to the otherwise modern space and a nod in the direction of the old Malaysian style teahouses. 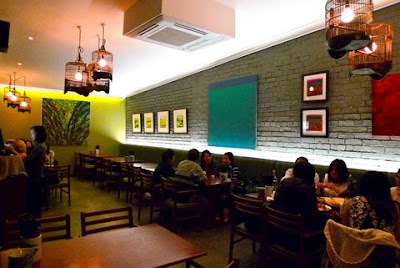 Vibrant, modern artwork brightens up the concrete-gray brick walls and low-level lighting, adding a contemporary feel. The restaurant is divided into three sections: a main dining section, a bar and a courtyard. Peroni, Grolsch, Bluetounge Pilsner and Bluetoungue Premium are offered on tap alongside bottled beers, ciders and mixed drinks. 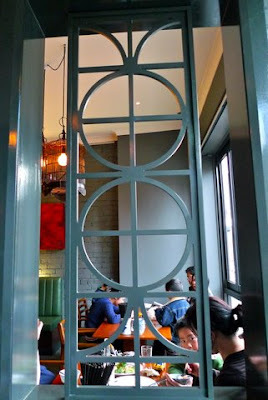 The extensive, five-page wine list leaves one stumped for choice, and cocktails range from apple martinis to a concoction of lychee liqueur, vodka, apple juice, lychee syrup and mint. If the littlies or the teetotalers want to join in, then order a fresh coconut juice, served in a green coconut shell. 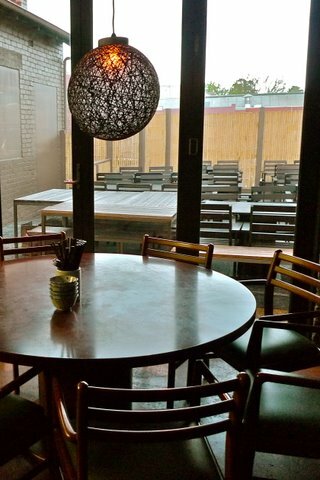 The courtyard will soon be a sought after spot as those warm summer nights set in, but the outdoor ambience would benefit from some greenery in place of a table or two. 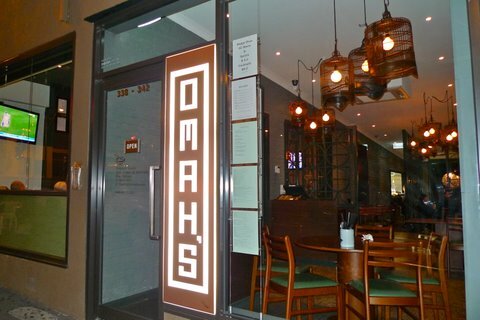 The menu at Omah’s features Nyonyan cooking, a style that employs Chinese methods and ingredients combined with Indonesian spices… except Omah’s use Aussie produce! You are sure to find some classic Nyonyan ingredients in their cooking, including coconut milk, galangal, laksa leaf, pandan leaves, tamarind, lemon grass, rice and egg noodles, kaffir lime and cincaluk (see the Melbourne Food and Wine post for this last one!). We visited on a Sunday night. Bookings are recommended for larger groups and Saturdays. If you’re feeling lazy, Omah’s deliver within a 3km radius. However it is definitely worth popping in for the efficient service alone. We were greeted as we arrived, checked twice during our meal, provided with knowledgeable answers to our questions, met with apology for a minor mishap, and farewelled as we departed. We ordered a little bit of everything including starters, mains and desserts, and our meal came to just over $30 a head for five people without drinks. 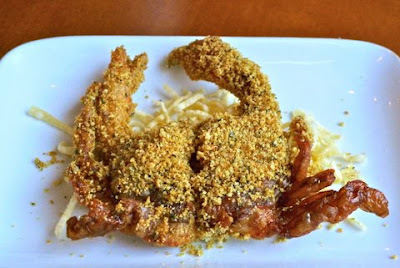 First up was the soft shell crab, which was lightly fried and covered in biscuit crumbs. It was presented on a bed of crispy noodles, which mirrored the texture of the batter. The whole crab could be crunched and eaten, without trying to extract the meat. Overall, it was an oily but tasty option. 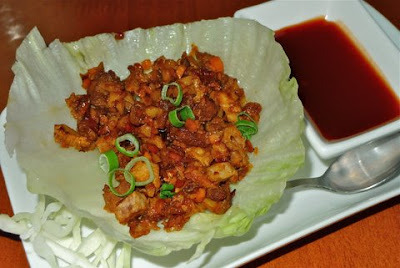 The sang choy bao with minced duck meat was superior to the usual pork suspects. Carrot and water chestnut added substance to the starter. It arrived sprinkled with spring onion in a crisp lettuce shell with a dipping sauce. 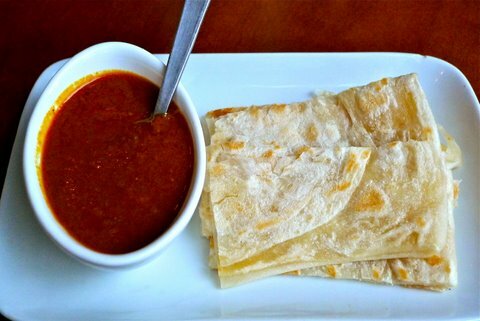 To borrow from Kraft’s peanut butter copy line, the roti bread was ‘never oily, never dry.’ The peanut sauce accompaniment is made on the premises by the chef. If you don’t order the roti, you can still order a side of the peanut sauce to jazz up the white rice. We ate two beef dishes: honey black pepper beef and crispy beef. The latter was the standout. 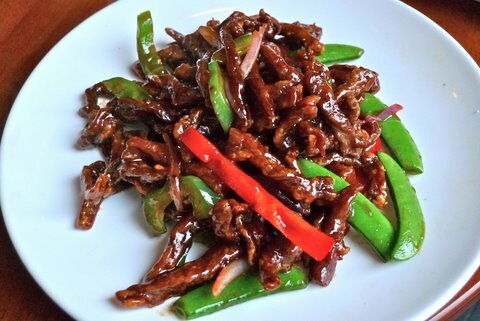 The sticky, shredded steak was covered in a thick sauce and dotted with red and green capsicum and fresh sugar snap peas. The honey black pepper beef won points for presentation. 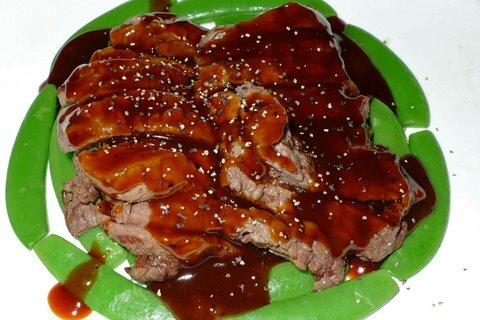 The marinated eye fillet was cooked medium rare and arrived encircled by crunchy sugar snap peas. As someone who doesn’t eat tons of meat, it was a little gamey for me, although the boys devoured it in a manner reminiscent of Neanderthals. 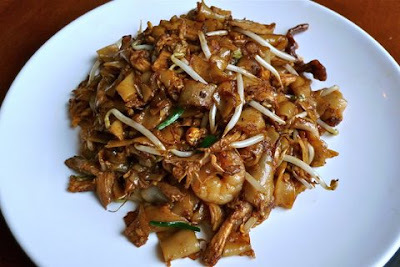 Next up was the fried Kueh Teow, a must try for any one who loves their rice noodles. 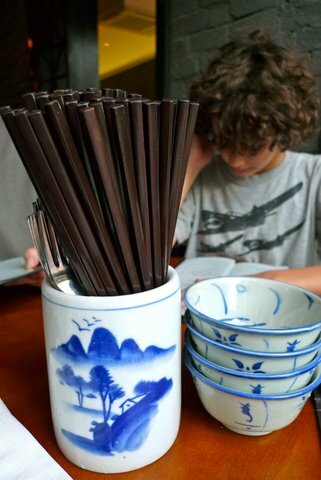 The noodles are fried in a dark soy sauce with egg, prawns, fish cake, bean shoots and spices. The ingredients form a small mound in the middle of the plate and despite the myriad of ingredients, the Nyonyan flavours really shone through. With an abundance of seafood and meat dishes, we thought it best to order something vegetarian. 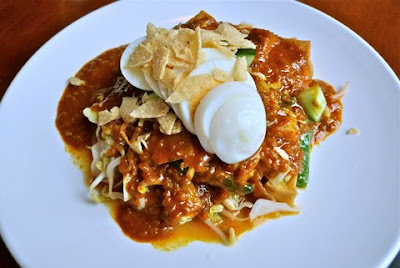 Gado-Gado is a traditional Malaysian dish of steamed veggies, chunks of tofu and a sliced boiled egg. It was served practically drowning in the thick peanut sauce, but the distinctive Malay flavours remained true nonetheless. Be ready for a hit of chilli with this one! Maybe it’s just me, but I always crave sweets after Asian food. 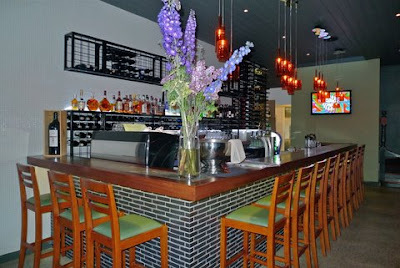 Omah’s offer a mixed desserts option, where you and a partner can order thee desserts for $18. We enjoyed the tapioca pudding made from cassava (or tapioca root), coconut milk and eggs. It resembled a moist version of a sponge cake. 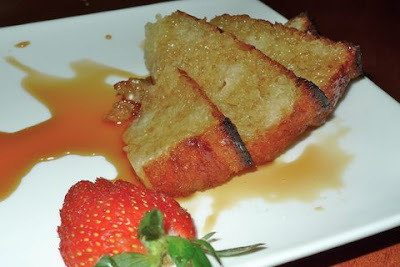 Served with vanilla ice cream and drizzled with sugary syrup, it had an almost juicy consistency. The Pandan sago was my favourite dessert of the bunch. 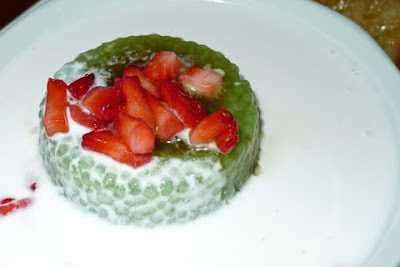 The glutinous, green sago balls were condensed into a stand-alone pudding, which was immersed in refreshing coconut milk and topped with a plump strawberry. As you spooned each mouthful, melted palm sugar would surface, creating a swirling brown pattern amongst the creamy coconut milk. The only criticism of this delightful meal was the mango pudding. 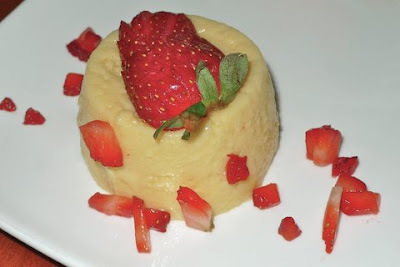 It looked divine: a pale yellow, jelly-like pudding strewn with chopped strawberries. Unfortunately it was past its prime and had an unnatural fizz. We informed our waitress, who apologized profusely and offered to replace it. We accepted her offer, but asked for another Pandan sago instead, seeing as we had fought over finishing the last one! Now before I continue, imagine going to a gallery and not seeing any of the artwork. You might stop in the souvenir shop and buy a Picasso magnet, but you don’t actually walk through each of the display rooms. The same can be said of Omah’s Ice Kechang: you simply can’t visit and not order one. In fact, the dessert is a work of art itself. 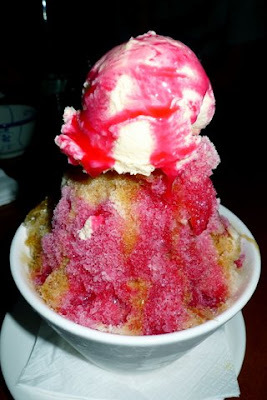 A mountain of shaved ice was bestowed upon our table, a ball of vanilla ice cream balanced on its peak. The ice was shot through with streaks of brown and pink palm sugar and rose syrup. We dug beneath the colourful, evaporated milk-drenched snow to get to the best bits. Hidden at the bottom of the bowl was a treasure chest of textures including crunchy creamed corn, rubbery agar jelly, chewy palm seeds and slippery lychees. 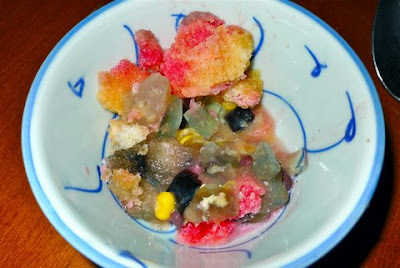 The Ice Kechang is a must-try for something different. It’s also big enough to share, if you can bring yourself to sacrifice some of it. As we discovered, the range of dishes at Omah’s is significant. 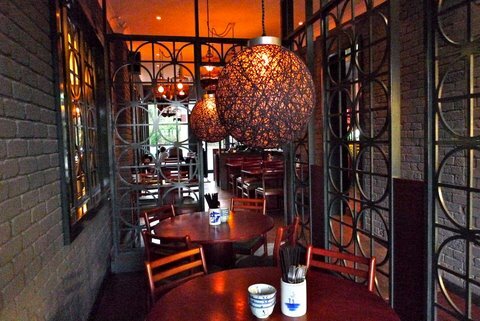 If you don’t know where to start, opt for a dinner banquet. Prices range from $33 to $50 dollars per head. The junior menu is also a great option for children, although they will insist on an Iced Kechang if they finish their meal! Omah’s has brought tasty, traditional Nyonyan fare to the heart of Hawthorn. If you don’t live locally, head to their sister restaurant in Port Melbourne. Luckily for me, the Hawthorn joint is just around the corner. Omah’s whole crab is arguably the best in Melbourne, and a visit is warranted based on this fact alone.